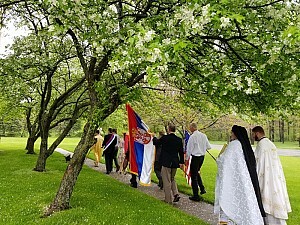 The St. George Serbian Orthodox Church in Hermitage, Pennsylvania has been celebrating the Divine Liturgy and proclaiming the Gospel of the Lord Jesus Christ in the current location since 1987. In 1987 +His Eminence Metropolitan CHRISTOPHER, then Diocesan Bishop of Eastern America, with concelebrating hierarchs and clergy, officiated at the consecration of the new St. George Church. The parish originally was located in nearby Farrell and served the faithful well until relocating to Hermitage. Construction of the present church was begun when Very Reverend Stavrophor Rade Merick was the parish priest. The current church was completed during the tenure of Very Reverend Stavrophor Janko Zdinak. Reverend Father Vedran Grabic is the current parish priest. Father Vedran is resolute in advancing the Gospel in the way of St. Sava. Following +Metropolitan CHRISTOPHER’s Episcopacy, His Grace Bishop Dr. MITROPHAN served the Eastern Diocese for twenty five years. His Grace Bishop IRINEJ became Diocesan Bishop in 2016. The St. George Church is in the Cleveland Deanery of the Eastern American Diocese. Very Reverend Dragan Goronjic is the Diocesan Dean. 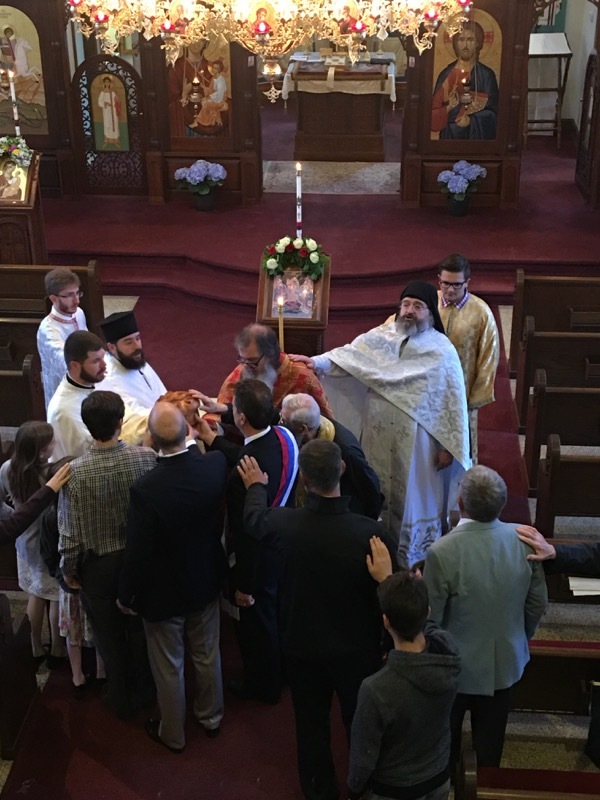 This year’s Slava celebration was held on Sunday, May 13, 2018. Serving at the Divine Liturgy with Father Grabic were Protopresbyter Stavrophor Dr. Rodney Torbic and Very Reverend Protosingelos Sava(Medakovich). Protopresbyter Stavrophor Dragolub Malich was in the Holy Altar during the Divine Liturgy and participated in the Festal Procession. Reverend Father Michael Gavrilos from the Greek Orthodox Church participated in the Procession. The Slava Kolac’ and Koljvo were blessed following the Festal Procession. Valerie Backo directed the inspiring responses of the St. George Church Choir. Bosko and Evelyn Vucenovic served as honored Kum and Kuma. The Paschal troparion and troparion to St. George the Great Martyr lifted hearts and minds of the faithful as they processed around the church three times. God blessed the parish with favorable weather for this glorious day. The St. George Kolo prepared the festal dinner in the parish hall. Parish Executive Board President George Backo served as Master of Ceremonies at the Slava program. Longtime Episcopal Deputy until his retirement, Proto Malich spoke about his prayers for the promising long term future of the parish. Fifty years had elapsed since Proto Malich served St. George Church in Farrell as parish priest. Proto Malich recalled in his remarks the pillars of the parish now departed this life and those still present having an active presence. Kum Bosko and Kuma Evelyn Vucenovich were recognized. Kum Bosko spoke with conviction. Very Reverend Bosko and Protinica Rada Stojanovic from Holy Trinity Serbian Orthodox Church, Laird Avenue in Youngstown, Ohio attended the dinner. Parishioners from Holy Trinity Serbian Orthodox Church, Raccoon Road, Youngstown, Ohio attended the Divine Liturgy and the dinner. Altar server Josh Vucenovic was recognized during the Slava dinner as a new college graduate. Board President George Backo was very complimentary of Father Grabic’s priestly example, dedication and service. Mr. Backo thanked the St. George Kolo for the wonderful Slava dinner. He thanked all for coming. Choir Director and faithful parishioner Valerie Backo accepted the honor to be Kuma for the next parish Slava. Thank God for the Father Vedran and Popadija Svetlana Grabic and the faithful parishioners and friends of St. George Church.